For the building with the same name, see Historic Strawberry Mansion. Strawberry Mansion is a neighborhood in the United States city of Philadelphia, Pennsylvania, located east of Fairmount Park in North Philadelphia. The neighborhood is bounded by 33rd Street to the west, 29th Street to the east, Lehigh Avenue to the north, and Oxford Street to the south. As of the 2000 census, the neighborhood had a population of 22,562. It is often associated with the historic house of the same name, Historic Strawberry Mansion, located adjacent to the neighborhood and generally thought to be the source of the community's name. In 2005, the 19121 zip code, which contains Strawberry Mansion, had a median home sale price of $47,900. This was an 85% increase, the largest of any zip code in Philadelphia, from the 2004 median sale price. Formerly known as Summerville, the neighborhood takes its name from a house known as Strawberry Mansion, at one time housing a restaurant known for strawberries and cream. Strawberry Mansion was home to a number of Philadelphia's wealthiest families in the 19th Century. In 1880, The average home price was higher than 85% of the houses in Philadelphia. The Jewish community started in the late 1890s, as the community migrated from Northern Liberties and Fairmount. After the turn of the century, many Jews living in South Philadelphia moved to then greener neighborhoods of the city. The first synagogue in the neighborhood was Beth Israel, which moved in 1909 from Eighth and Jefferson to 32nd and Berks. In 1913, a real estate broker placed an ad in the Philadelphia Jewish Herald encouraging Jews to leave South Philadelphia's Jewish quarter and move to the “fresh air” and “beautiful country landscape” of Strawberry Mansion. At its height, about one-fifth of the Jewish population in the city lived in the enclave between Lehigh and Oxford streets, and 29th and 33rd streets. The Jews built a community, and eventually left for Oxford Circle, Overbrook Park, and West Oak Lane-Mt. Airy. There were at least 21 synagogues in the neighborhood, built for the most part in the first quarter of the 20th century. By 2015, six of the buildings remained and had been transformed into churches. The 1950s and 1960s brought an economic decline and urban decay. In 2000, the neighborhood had the lowest average home price in the city. Modern Strawberry Mansion has acquired a reputation as one of the most dangerous areas of Philadelphia. The neighborhood is quite large in area and in population and has been difficult to police or maintain with historically inadequate city funding. However, as of 2005, the southern and western boundaries of Strawberry Mansion have shown signs of gentrification. Feeding off the mixed successes of neighbor Brewerytown to the south, artist lofts have been planned in derelict factories. Additionally, property values have risen dramatically on properties abutting Fairmount Park on the western boundary of Strawberry Mansion. A number of stately park-side homes in varying states of disrepair can be found in what was once one of the wealthiest areas in Philadelphia. Many structures have already been completely restored in an area that was ignored for decades, but crime continues to plague the area. Strawberry Mansion has also been home to horses and urban cowboys for generations. One local group, the Fletcher Street Urban Riding Club, provides activities and support to neighborhood children in the struggling area. A notable mural, "A Tribute to Urban Horsemen," can be viewed from the community garden on Montgomery Avenue near 33rd st. In 2015 it was announced that public access would be restored to the perimeter of a fallow basin of the East Park Reservoir in the first phase of a program to expand youth programs within the park. Then-Mayor Michael Nutter was quoted in ceremony, "What's demonstrated here today is that Strawberry Mansion will become the melting pot of the City of Philadelphia." Neighborhood residents eagerly await removal of the chain-link fence and barbed wire. The change is a significant expansion of the park side amenities afforded to neighborhood residents and the city, reflecting the wave of redevelopment in the area and renewed efforts to improve Fairmount Park. The community is bounded by Fairmount Park to the west, Lehigh Avenue to the north, Sedgley Avenue and the SEPTA rail tracks to the east, and Cecil B. Moore Avenue to the south. Bordering neighborhoods include Allegheny West to the north, Glenwood and Stanton to the east, and Brewerytown to the south. 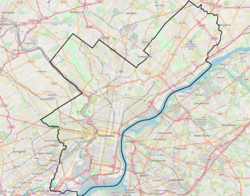 As of 2010, Strawberry Mansion was 94.3% black or African American, 2.3% white or European American, 1.6% Hispanic, 0.8% Asian, and 1% all other. The School District of Philadelphia serves Strawberry Mansion. Strawberry Mansion High School is in the neighborhood. The high school and the area middle school shared a building with a third school, Leslie P. Hill Elementary School, which was a K-8 school, until it was closed in 2013. Many children, prior to the close, attended elementary, junior, and high school without leaving the building. Now the neighborhood school that feeds into SMHS is James G. Blaine at 30th and Berks. In 2015, a music recording studio opened at Strawberry Mansion High school financed by popular recording artist Drake. The historic Most Precious Blood School is also located in the neighborhood. John Coltrane (1926–1967), musician and composer, lived at 1511 North 33rd Street from 1952 to 1958, and later bought it for his mother. The John Coltrane House, currently owned by his cousin, is designated a National Historic Landmark. Larry Fine (1902–1975), comedian, member of the Three Stooges lived on Clifford St.
NBA player Ronald "Flip" Murray (b. 1979) attended Strawberry Mansion High School. As a child, Grammy-nominated singer-songwriter Jazmine Sullivan (b. 1987) lived in Strawberry Mansion. ^ Lin, Jeffrey (2017). "Understanding Gentrification's Causes" (PDF). Federal Reserve Bank of Philadelphia. ^ Hingston, Sandy (2015-12-07). "10 Things You Might Not Know About Philly's Jewish Quarter". phillymag.com. Philadelphia Magazine. Retrieved 2018-09-16. ^ Macy, Evan (2009-12-12). "Strawberry Mansion: A Former Resident Returns". philadelphianeighborhoods.com. Department of Journalism at the Lew Klein College of Media and Communication at Temple University. Retrieved 2018-09-17. ^ Buozis, Michael (2015-01-07). "The Last Synagogues Of Strawberry Mansion". hiddencityphila.org. Hidden City Daily. Retrieved 2018-09-17. ^ "Philadelphia Neighborhoods and Place Names, Q-Z." City of Philadelphia. Retrieved on October 4, 2011. ^ by the Notebook (2013-02-23). "Live blog: School closing hearings Day 3". Thenotebook.org. Retrieved 2016-02-19. ^ "Students of Struggling Philadelphia High School Start Using Recording Studio Donated by Drake - ABC News". Abcnews.go.com. 2015-03-10. Retrieved 2016-02-19. ^ "Strawberry Mansion: The Jewish Community of North Philadelphia - Allen Meyers - Google Books". Books.google.com. 1999-11-15. Retrieved 2016-02-19.